Amed is a stretch of tiny villages along the coastline of Bali, Indonesia‘s most famous island, in Southeast Asia. Laid-back and charmingly modest, the area is a world away from the hustle of the island’s busier tourist destinations such as Seminyak. Here are seven of the most blissful things to do in Amed, Bali. 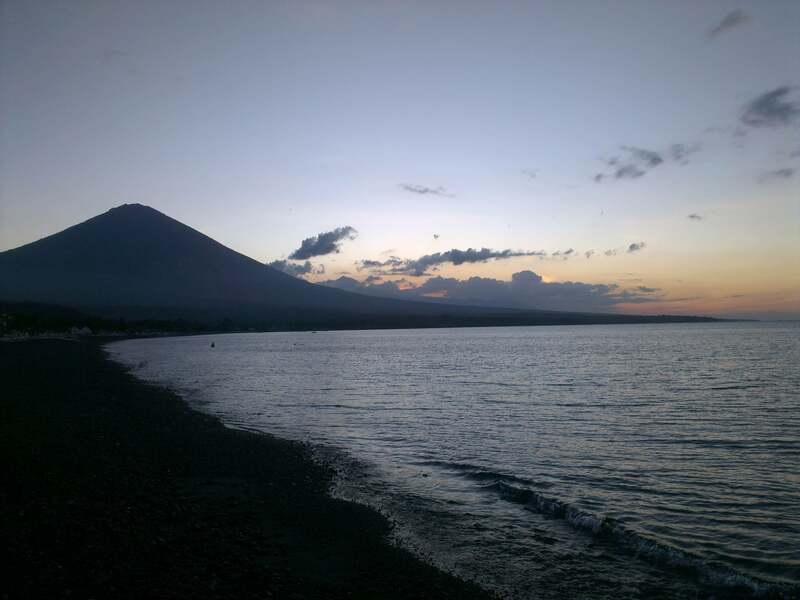 So where exactly is Amed in Bali? It’s on the coast of east Bali. From Bali’s Ngurah Rai International Airport in Denpasar to Amed, it’s two and a half hours by taxi, and around the same travel time from where we were in Ubud to Amed. However there is a beautiful stop along the way. 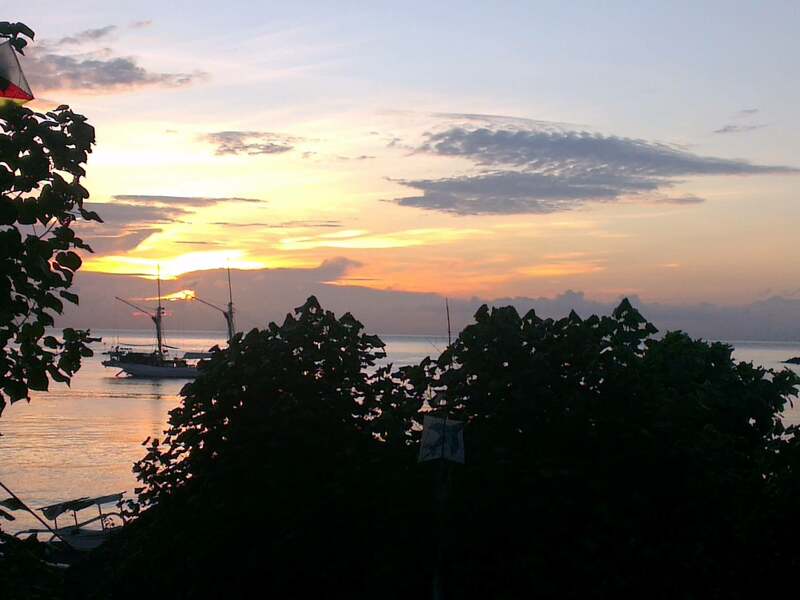 On the way to Amed, Bali things to do include visiting temples and tourist attractions. 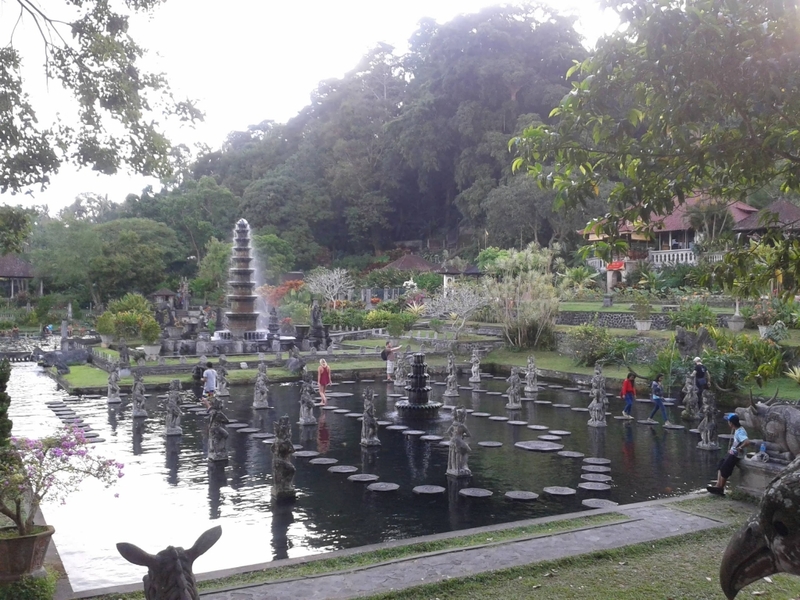 Halfway through our journey from Ubud to Amed, our taxi driver took us to the Tirta Gangga water palace. Here, you can wander around the peaceful gardens and fountains, and hop between paving stones like lily pads across the main pond. Even though it’s one of Bali’s more off-the-beaten-track locations, there are many places to stay in Amed, from beautiful beach resorts to humble guest houses. When deciding where to stay in Amed, we ended up choosing Jemeluk Bay, a 15 minute walk from the village where the Amed area takes its name. Here, there are a number of hotels and accommodation options to suit different budgets. We chose Dharma Yoga, a spacious, sunny and affordable homestay with reliable WiFi connection, managed by the delightful manager, Ketut. The upstairs rooms have a large balcony overlooking the sea. Every day we enjoyed the glorious sunrises. If you are looking for a friendly yoga resort with stunning sea views and a swimming pool, check out the beautiful Balila Beach Resort. Browse and book all the best guesthouses in Amed here. Dominating the area is the imposing Mount Agung, the island’s highest volcano. From the beach you can see awe-inspiring views of this impressive peak. 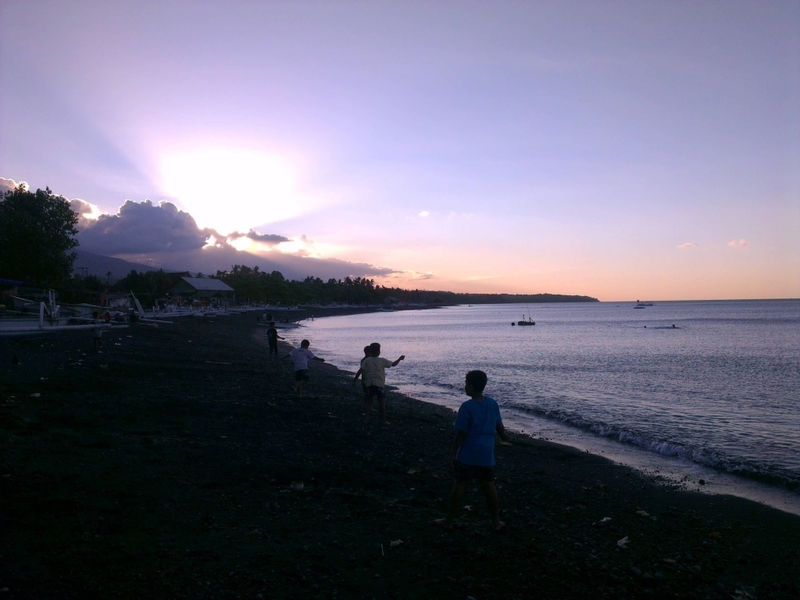 As Amed beach is close to Bali’s biggest volcano, you will likely be sunbathing on volcanic black sand. This is one of the most popular Amed things to do during the day. Why not hire some snorkelling equipment and explore some of the coast’s pretty underwater spots, which include an incredible underwater temple in Jemeluk Bay. If you’re feeling adventurous, there are renowned freediving centres in Amed. Life in Amed is super laid back and so are its people. We met a group of friendly local guys on the beach who really seemed to be enjoying life. Many of them have multiple jobs supporting the area’s tourism. This could span anything – or everything – from taxi driver to scuba diving assistant to restaurant server to reggae band performer. If you aren’t sure what to do in Amed, ask a local and these knowledgeable guys are sure to be able to help you. 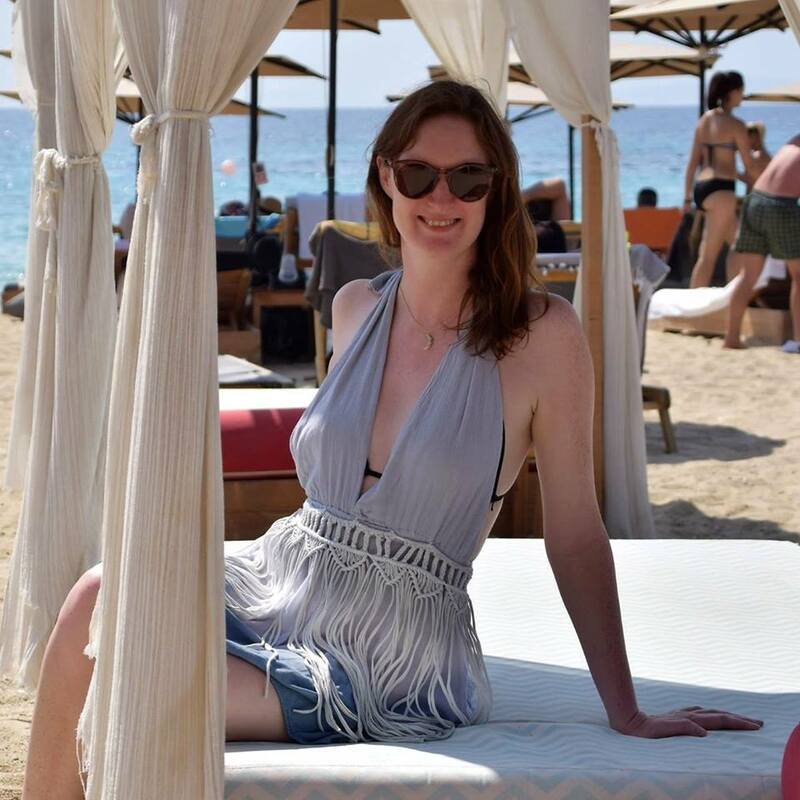 They invited us to the launch party for their new bar in a neighbouring village, where locals and tourists danced all night to the band’s cool reggae grooves. They made us feel really welcome and we enjoyed this taste of Amed’s nightlife. While we were in Amed, the neighbourhood was preparing for the Galungan festival, one of Bali’s most significant religious ceremonies. 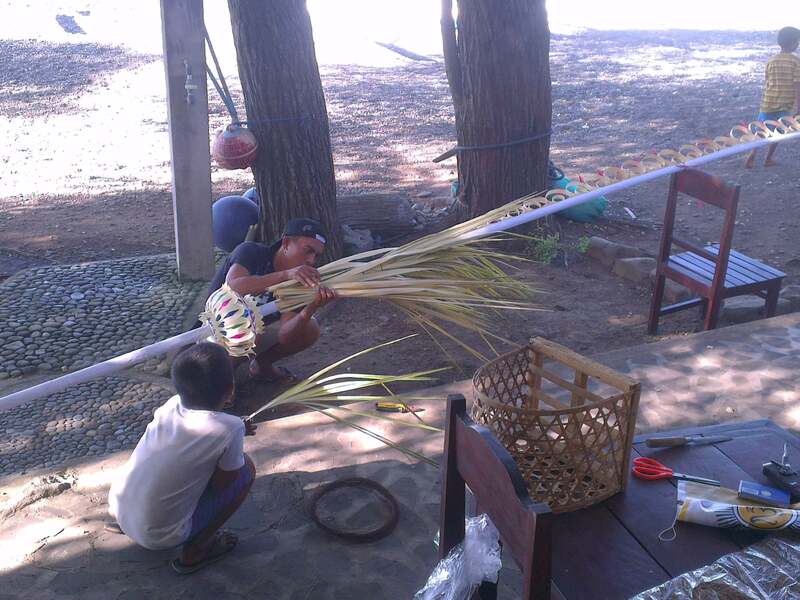 While having lunch one day, we chatted to a guy who was creating a penjor, a beautiful decorated bamboo pole which arches over the street, laden with gifts and offerings for the spirits. For the day of the festival itself, we received a kind offers from Ketut and her neighbours to borrow a motorbike and visit their family temple. 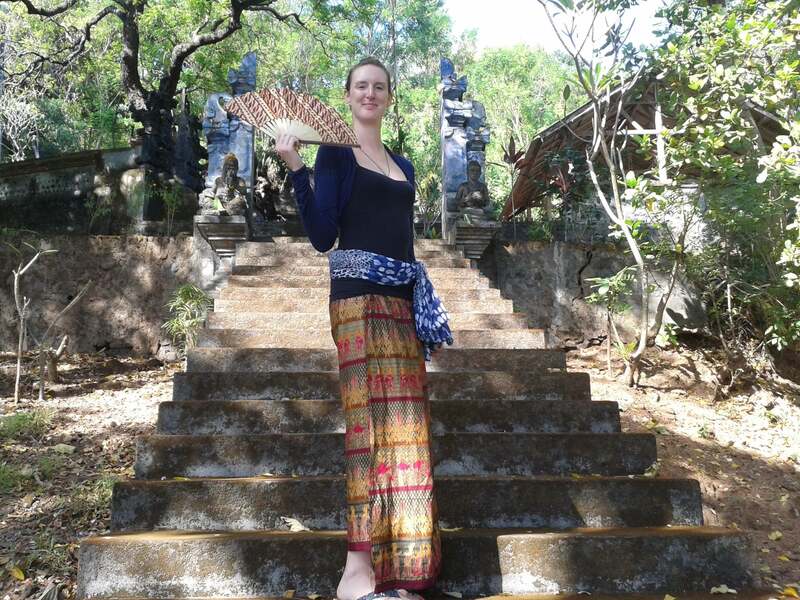 We dressed in our traditional Balinese sarongs and were welcomed in. Here we watched the women in their colourful lace and sashes carry plentiful offerings of food and flowers. Extended families from all over the country are reunited for this important event in the Balinese calendar. 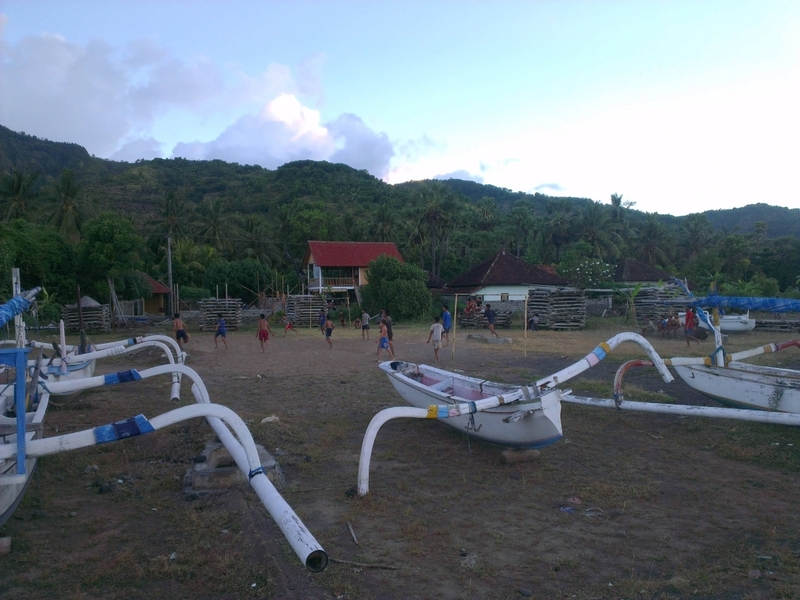 The highlight of our activities in Amed was a diving trip to nearby Tulamben, a fishing village and dive resort. It is home to the island’s well-known dive sites, the USS Liberty wreck. 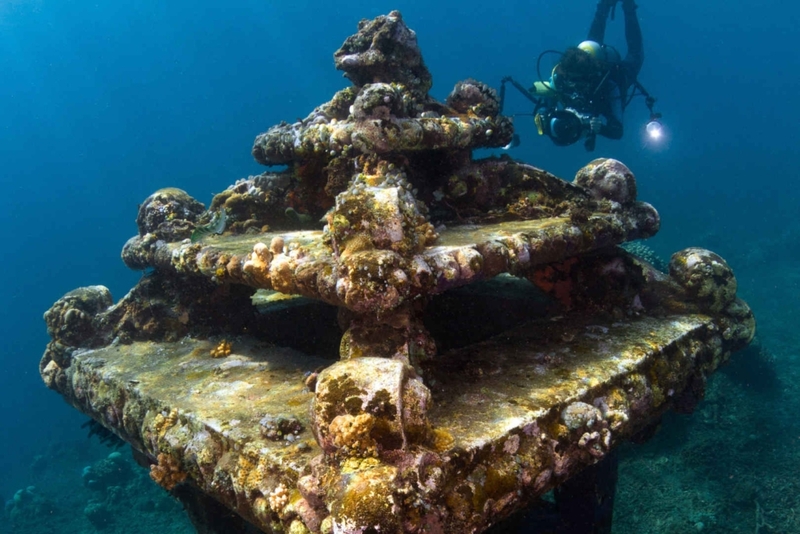 This ship, sunk by a Japanese submarine in 1942, lies in shallow water, so it’s accessible by even novice scuba divers. It had been one of my ambitions to explore a shipwreck and it was truly a magical experience. The ship’s dark iron skeleton is now home to an abundance of marine life and at one point, we even swam inside the wreckage. Below you can watch a video of our underwater adventure. After the Liberty wreck it was time to investigate a dive site known as the Tulamben drop-off, a sheer wall covered in colourful coral. 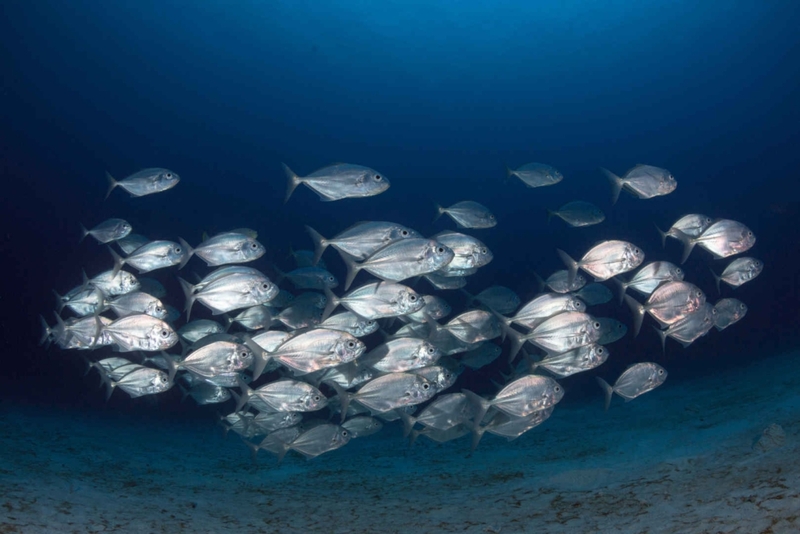 We were treated to a rare sighting of a school of large silver bumphead fish on their way to rest in the wreck for the evening. Amed is one of those disarmingly relaxed, slow-paced places where you arrive for a couple of days and end up staying for a week. We met other travellers who experienced the same thing. It’s a great place to unwind and appreciate the simple joys and life around you. There are plenty of blissful things to do in Amed, from having a relaxing massage or taking a yoga class, to dining in Amed’s best restaurants and warungs, while being entertained by a reggae band that will make you smile. Once you’re ready to move on, Amed is the perfect location to catch a fast boat to the popular Gili islands or head inland for the cool green hills and waterfalls of Munduk. Next up, discover more destinations that will make you fall in love with Bali. You definitely should – it’s such a lovely laid back part of the island. Hope you’re enjoying life in Chiang Mai! If I go back to to Bali i will have to stay there. I stayed in bad part of Bali (kuta beach. This area you wrote about looks amazing!